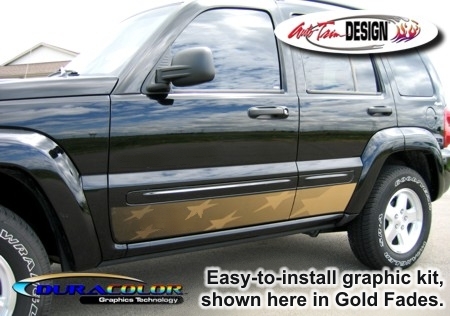 Dress up your '02-Current Jeep Liberty with these awesome looking "Field of Stars" body side graphics that are designed for the lower portion of the doors as shown. These graphics will give your vehicle a custom two-tone look. Uniquely designed with a gentle fade at the front to solid in the rear, Stars are set in a pattern that fade as well. Packaged with one (1) Driver Side and one (1) Passenger side graphic, kit includes easy to follow online application and care instructions. While front and rear are precut to the shape of the vehicle, slight trimming is required at door jambs.